The effect is large, almost 10 goals for an average team. This is a simplistic way of looking at it but 10 goals are worth ~6.4 points in the standings. And this is for teams who take an average number of shots. It’s easy to see a better team that generates a higher volume of shots losing out on a European place or even winning the league courtesy of a poor Sh%. There must have been something in the water in 2001-02. Looking at shot totals I don’t think they were counting very rigorously that season so that may explain it (or maybe ‘shot on target’ was redefined beginning in 03?). A special mention goes to Sunderland who appear in the ‘worst’ column three times! Next time I’ll go on to look at save percentage and see if whether the observations of shots hold true for defence. This honestly says nothing about shooting percentage. The correct way* to do this with easily available data is to compare a team’s SH% in Year 1 to in Year 2 and check the correlation. Using 09/10->10/11, 10/11->11/12, and 11/12->12/13 I got an R of 0.55. That says a team’s SH% in Year 2 can be explained about 50% by Year 1 and 50% by average (~10%). That’s pretty significant. And that’s using only one season. If we have evidence of a team being >12.5% shooting for four straight seasons (United 2009-2013), it’s hard to argue that that isn’t a critically important piece of data to consider if we want to judge how good a team’s offense is likely to be. Fair enough. I apologize for misreading 2011 as 2013. Appreciate the link. More importantly is the premise that “luck plays a massive role in team shooting percentage”. The role of luck in Yr1->Yr2 is about equal to skill; ie, next season we’d predict United to shoot ~12% on all shots. Using a method that relies only on shots (or shot ratios or comparable shot ratios) forces you to consider United average at shooting. That’s clearly incorrect. To say that “how well a team does one season has minimal bearing on how they should be expected to perform the next season” is completely false. Team shooting percentage regressed to the mean is more accurate than relying solely on shots (at least on offense). I think this is dead wrong. Shots may correlate the best of all stats by themselves, but you have shooting percentage data available that can easily improve your predictions. There’s no reason to pretend that a Wigan shot is the same as a United shot. 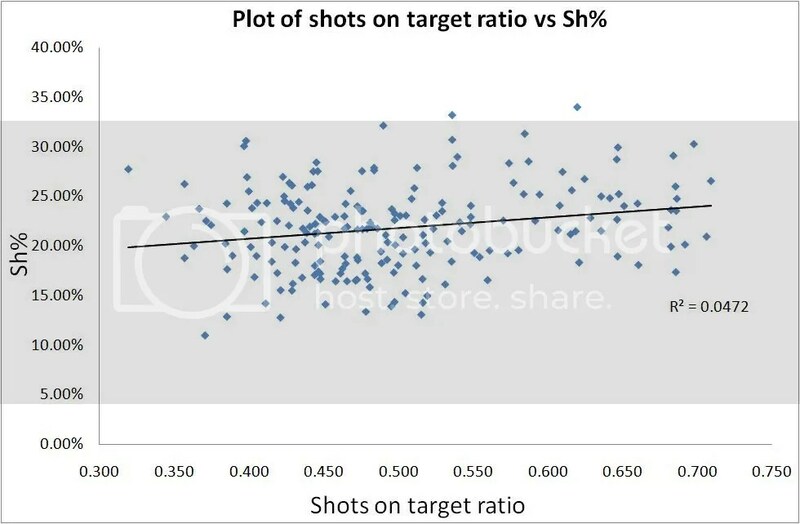 There’s no surprise that you’ve underestimated United and overestimated Liverpool each of the last three years when they’re the biggest examples of either Low Shots/High Percentage or High Shots/Low Percentage. 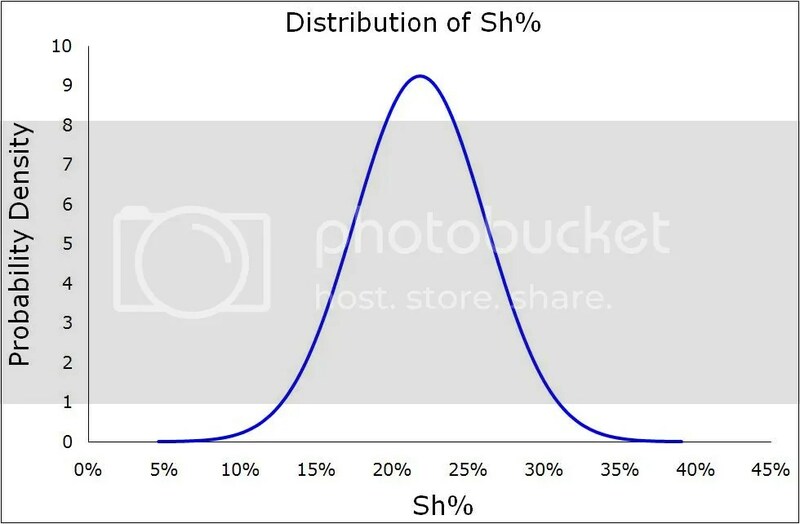 I agree re the proposed study on sh% across multiple years, it’s something I have planned this summer (although subject to all sorts of biases I have to think of a way to work around), but other than that you’ve come back with another round of ‘I’ve done none of the work thus have no evidence to the contrary, but know exactly what’s wrong with your model’, and it’s really tiresome. I assume you’ve done this and know, and published the data, because making this statement otherwise is just incredibly lazy. Once again, if you’ve done this study then post the results – if you can improve on a model you deserve the credit for it, otherwise you have nothing but a theory. Combine the prior two responses. The data I use is freely available, there’s links to it all over this site, get off your high horse and do the work. EPL, La Liga, Serie A, Ligue 1 2009/10-2012/13 for 2012/13 teams that met the criteria of either 2 (n=58) or 3 (n=53) years of prior participation in highest level. Nice – so how much would you estimate relegation drives up the R values? Not sure if it does. The result is completely driven by the teams above average. Teams below average are completely random, I would guess because relegation tosses the truly bad teams out of the sample. Now, relegation also tosses out unlucky teams who would simply be mediocre the following year, but it works both ways. Most importantly, this highlights that there are teams that shoot consistently above average, even over multiple seasons and with multiple teams.